When you enter the shrine, you notice a group of people off to the left. Speak with the Chancellor to find out about Lenna’s father. The pot to the south is a recovery pot, a mini version of the recovery spring. If you get beat up on the floors above, come back down here to heal. Speak to the man to the left of the pot to receive five Potions. They may not sound like much but they may come in handy during the boss fight. There are no random battles on the first floor of the Shrine, so you can wander the halls without fear. You enter the second floor from the top right corner. The top left corner contains the first treasure chest of the dungeon. Keep your excitement at bay; the chest only contains a Tent. Enter the door in the center of the room and you will see an oddly glowing circle. 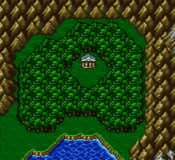 Final Fantasy veterans should recognize this as the beloved save spot, now known as the “Consecrated Circle.” Here you can use a Tent or save your progress. The wise gamer saves her game often. From the consecrated circle, exit south and head east to a room with another treasure chest, this one containing a Leather Cap. Proceed west to continue your ascent to the third floor. Wind around the corridor until you find three doors (or if you’re sneaky, cut east through the wall just below the door—you’ll see the passage once you have a thief). If you don’t feel up to more random battles, ignore the eastern door. There is nothing at all in the room behind it. Before goading the large bird into a fight, enter the door to the west and claim the Broadsword in its chest. After taking a few deep breaths (and equipping all of your Broadswords and making sure you’re adequately healed) challenge the bird. Welcome to your first boss battle. Wing Raptor is not difficult if you have equipped your entire party with Broadswords. Since you don’t have any jobs yet, all you can do is physically attack him. Just beat on him (while his wings are open) until he collapses in a bloody pulp. It shouldn’t take too long to beat him, but he may get off a few rounds of Breath Wing that does about 20-25 points of damage to all party members (It is a wind-elemental attack that does damage equal to ¼ the target’s maximum hp). Unfortunately defending doesn’t reduce the amount of damage taken from Breath Wing, so just hit him with all you’ve got. Remember the five potions you got at the beginning of the dungeon? Use them while Wing Raptor’s wings are closed. Do not attack while its wings are closed! Wing Raptor will counterattack with its claw attack (which never misses) and the fewer hits you take the better. Enter the door that Wing Raptor guarded and continue to the fourth floor. It looks deceptively empty. If you walk to the bottom of southeastern pillar you’ll be rewarded with a glimpse of a treasure chest. Fumble your way south and then to the east to claim your prize—a Staff. The stairway leads up to your final destination, the Wind Crystal. The crystal has already shattered and shards of it lie about waiting to impart their power to your party. A scene will occur with Lenna’s father. After learning that the other three crystals will soon shatter and you must work to save them, you receive your first six jobs: knight, monk, thief, white mage, black mage, and blue mage. If, after all that fighting, you’re in the mood for some more, transform a few (or all for ease of learning) of your characters into blue mages and head back inside the shrine. There you can learn two blue magic spells. Fight Moldwynds to learn Aero and Black Goblins to learn Goblin Punch. Before continuing on to the next quest, you can head back to the Pirate Cave where you left your companion Boko. You can reach the rooms the pirates were snoozing in front of earlier and gather up some of their loot. TIf you spend some time in the Wind Shrine to gain ABP, the Moldwynd enemies drop Elixirs rather easily, and Elixirs are always good to have. Maybe it's me, but I find Blue Mages entirely useless. If you wait with going back to the pirate cave until after getting the Canal Key from Zok and the pirates goodbye to Faris in Tule you can get 8 potions from one of the pirates. A fool proof way to kill the raptor is with all of your characters equip with broad sword, and a full suit of leather. He should go down in 6-8 hits with minimal damage to you characters, and usually before he can close his wings. I wholeheartedly agree, but you do not gain the ability to use jobs until after you complete the Wind Shrine. A good choice for jobs would be Knight, White Mage, Black Mage, & Monk. But that's just me.